If your future includes a move to Moreno Valley, check out Meathead Movers! Our professionally trained student-athlete movers, moving concierge, and princess packers are prepared to get you safely moved into your new Moreno Valley home. 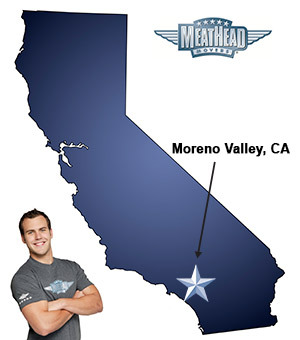 When you make your move to Moreno Valley, be sure to contact Meathead Movers. No matter what type of moving service you need, our student-athlete movers are ready to handle all your moving needs. Welcome to Meathead Movers of Moreno Valley! If you are considering moving to or from anywhere in Moreno Valley, CA, we are the moving company for you! Our professionally trained student-athlete movers and our move concierge are here to help you with every stage of your move in Moreno Valley. With its family-friendly lifestyle, good schools, impressive quality-of-life and growing job centers, it is no wonder Moreno Valley is Riverside County’s second most populous city. Its abundance of great parks, affordable housing, and outstanding public safety makes this city a great place for young families. Our moving company specializes in local, long-distance, and commercial moves to, from, and within Moreno Valley. We also provide reliable packing, storage, on-site relocations, and our distinctive moving concierge service, which connects you with local service providers. All our student-athlete movers are thoroughly screened and trained before their very first move. With branches not just in Moreno Valley, but all throughout California, we are your one-stop resource for all your moving needs, no matter where your California move takes you. In fact, you can see what your neighbors in Moreno Valley have to say about us! With our 100% satisfaction guarantee, the only thing you have to lose is the stress that comes from moving! So contact us today for a free no-obligation moving quote and to learn how we can help you on your next move! Moving to Moreno Valley? Here are some helpful resources. View more Moreno Valley resources. make sure every single box packed is labeled, wrap sensitive/delicate items more securely, ensure coordinators inform clients about not being able to dismount tv's ect.. and disconnect wash and dryers prior to move, have movers and packers thoroughly clean up after themselves and go the extra mile to ensure damages do not occur. So helpful and friendly and accommodating. I have had to reschedule my move date like 3 times and no matter who answers my call they always say "Of course, no problem".